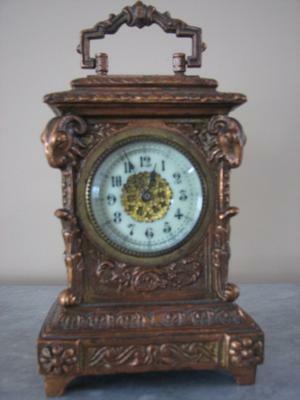 This clock is approximately 7" tall with the top handle fully extended. It might be cast iron with a copper-colored plating? I'm not sure, but it's quite heavy for a small clock. It has ram heads on the 4 corners of the clock, and sits on short pedestal legs. It belonged to a woman who was 88 when she died, and it came to us in her estate. She lived in Lima, OH but was born in Hamilton, OH. We don't know anything about the history of the clock. Sometime in the '80s we took it to a clock repair shop and they got it running and made a new key for it. It worked for awhile, but then stopped again. The clock face and inner workings seem to be original. The clock face says "Made by the New Haven Clock Co., New Haven, Conn U.S.A. It does not appear to have any other markings on it. We've always wondered about it and would love it if someone could tell us more about it.